Why: The story of the men whose entrepreneurial dreams and competitive spirit created the coast-to-coast economy. As the 150th anniversary of the Civil War comes to a close (you were aware of this, right? ), the observance of another 150th anniversary has just begun. Maybe I’m more in tune to this anniversary than your average Joe. I come from a railroad family; my grandfather was gainfully employed by the Great Northern Railway for his entire life, a position that shielded his family from the ravages of the Great Depression. Then there’s my civil engineer father, whose greatest joy in life was simply to build things. I’m speaking, of course, of the sesquicentennial of the building of the transcontinental railroad. 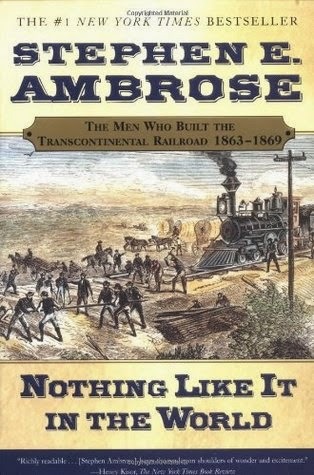 Stephen Ambrose calls this “the greatest achievement of the American people in the nineteenth century,” and it’s hard to argue with this assessment. Before the Union Pacific drove west to meet the Central Pacific building toward the east at a lonely place in Utah called Promontory Summit, before the golden spike completed the first direct railroad line from New York to San Francisco, it took eight months and cost $1,000 or more to travel between those two cities. Afterward, anyone with a week at their disposal and $65 in their pocket could make the trip. The effect on the economy—and, indeed, on the everyday lives of Americans—was nothing short of miraculous. “Things that could not be imagined before the Civil War now became common.” A national market for goods and financial instruments emerged, leading to the creation of a national culture. And all of it came about because of a few entrepreneurs. Take, for example, the principals of the Central Pacific, the “Big Four:” Leland Stanford, Charles Crocker, Collis Huntington, and Mark Hopkins. Living in California in the early 1980s, I couldn’t escape the legacies of these men: I was a student at Stanford University, I kept what little money I had in the Crocker National Bank (soon thereafter acquired by Wells Fargo), and I had drinks with friends at the Top of the Mark (the rooftop bar at the Mark Hopkins Hotel on Nob Hill in San Francisco). I only wish I’d known more about how their entrepreneurial dreams in a very real sense built this country.